Wild North is 40 Paylines and 5 reels video slot game powered by Play’n Go software platform. Wild North Slot is inspired by wildlife and the reels of the game are being set against the backdrop of pine trees covered in snow. Maximum coins per line for the game is 20, whereas coins size ranges from 0.01 to 5. You can play Wild North casino slot at any Play’n Go casino site. Before you start playing the slot, you would have to select the “Bet quick panel” which is used to choose the desired coins denomination you wish to bet. The “spin: option starts spinning the reels, whereas the “auto Play” option turns the reels in motion for a chosen number of times without any interference. 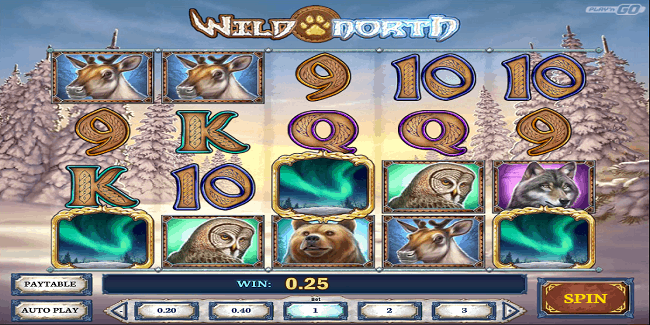 Wild North Slot contains 8 special features which includes Stacked Wild, and a Scatter symbol. Special symbols of the game includes symbols like Reindeer, savage, Bear, Wold pack, Lynx, Northern Lights and Eyes of the Owl. “Lynx” is the wild symbol here in this game which can be substitute for any other symbol except of the scatter symbol. The scatter symbol in this game is quite inspired by Northern Lights. If you land on 3 or more scatter symbols on any reels, you would get Northern Lights Bonus round. The first bonus feature or Great Wilderness feature will provide you three free spins. Wild Lynx will also provide you 3 free spins and during these free spins one or two reel will be covered with Wild Lynx symbol. Savage Bear will award you one free spin and during these features multipliers will range from x5 up to x30. Wolf Pack feature will give you 1 free spin and additional wold pack will also provide you another free spin. The game provides a jackpot of 500 times of your total bet.